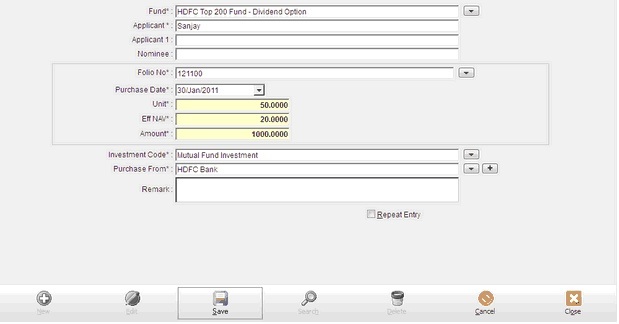 This form helps you fill up all the details of the mutual funds in which you invest, it contains entries of all the important details that you need to manage for a M.F. Fund Name Select Company name from list. Here you can see only those MF which are you added in personal fund. For more detail see Add in personal fund in mange mutual fund. Applicant 1 Maximum length allows 40 characters. Folio No Enter folio no of transaction. Date (Date) Enter date of fund purchasing. Investment code Select investment code from list. Purchase from Select account from list. Remark Maximum length allows 40 characters.